Probably because they try so hard(not in the Jags case) to fit so many goofy design elements onto the jersey and helmet that the pants have to remain plain to balance it out. My thoughts exactly. White is not needed. I am Cornholio, are you threatening me? I'll gladly take them darkening the blue a little if it means that they don't try to force a white outline on the numbers. Something about yellow numbers outlined by white that just ruins so many concepts for me. Honestly, and I know that this opinion is the minority opinion around here, any team that uses teal. Didn't like it in the 90's and still don't care for it. Looks incredibly dated to me. Jacksonville is the only team that came close to pulling it off. I think there is a happy medium in there. A darker royal blue, not quite navy. In between what they currently wear and say, the Giants helmet color. Anybody that had the displeasure of taking in a game in St Louis the year before they relocated already saw the trend of downplaying gold from most of the signage/graphics surrounding the field. Hell, Demoff even suggested as such in interviews that he was a big fan of the blue and white look. I think this was beginning to happen long before they arrived in LA. I started playing Blood Bowl sometime in the early to mid 90's. I always enjoyed the plays on professional team names ie, the Filthadelphia Orcles, Wushingtun Greenskins, New Orc Jyunts... To make a few. For those that didn't follow the link, think orcs, elves, dwarves playing football, with death and mayhem encouraged. Future of NFL "Color Rush"
The cynic in me thinks this is part of a greater conspiracy to appease the LA fans. 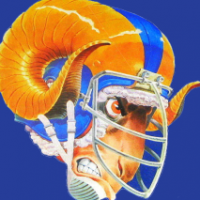 Craft the storyline that the big, bad NFL won't allow us to return to our sacred colors, only to have the Rams fight and win. A win for the "little guy" or the "new kid". See kids, we're not some faceless NFL team. We fought because we wanted to make you happy. Of course, I realize that they probably just underestimated the appeal of the Royal/Yellow. I mean, fans haven't been telling them that since 2000. I think you are getting real close. A couple critiques that I have as a complete amateur. Your Black and White version looks better for a reason. The white teeth are throwing off your color logo right now. Don't think that you have to keep them white to represent teeth. I think they actually will look fine as part of the main body color. Also, the ears would look so much better if they followed the same basic lines as your eyes and whiskers. As much as I want to will the Rams into wearing yellow, those shirts are clearly gold in poor lighting, IMO.